How much is success worth to you?? WOW this statement is so touching to me?? What am I willing to do to achieve and maintain success?? I have to be totally honest, in the last few months I realized that I am not doing everything that I can at this point. I know once you have tasted success, it is very difficult to go back to be unsuccessful. Knowing the steps to obtain the success will provide you the path to success. 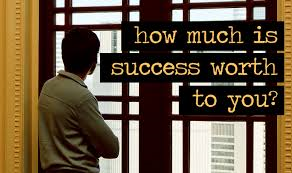 My question to you is How much is success worth to you? ?